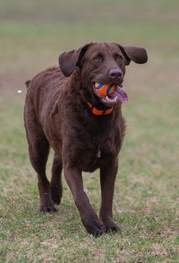 The Chesapeake Bay Retriever often referred to as the Chesapeake, CBR or Chessie, is a very affectionate playful breed with a distinct preference for family and friends. Being a bit more wary of strangers, they make good watch dogs and have been known to offer protection as well. They are comparable to the Labrador Retriever in looks and size, except for their hair coat. 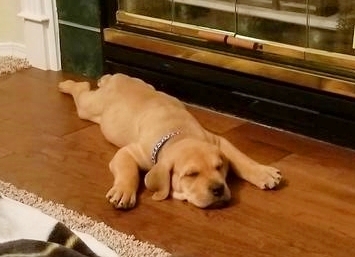 Chessies have thick wavy coats whereas the Labrador has a short straight coat. That is where the similarities end. They are not the “Happy-Go-Lucky” Retriever, loving everyone they meet. The are extremely loyal, hard-working, and thoughtful breed to their special humans. They may not be the best dog for everyone, but for a family who loves the outdoors, enjoys active pursuits and wants a close relationship with their dog, this could be the ideal breed. 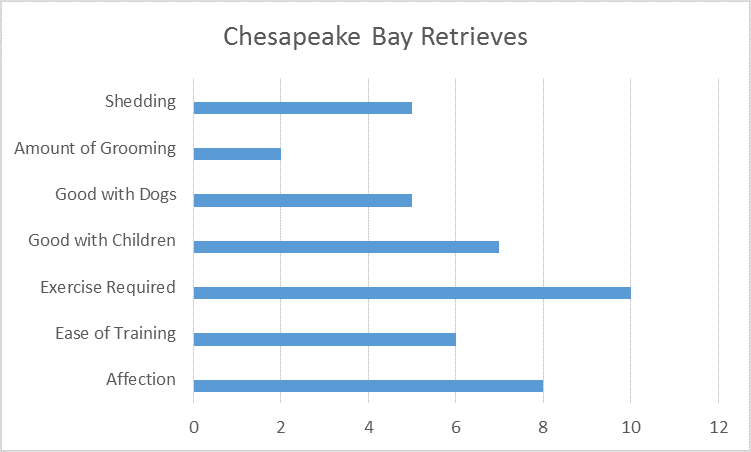 Chesapeake Bay Retrievers like to swim, boat, hike and hunt or just about any activity that will keep them close to their owner. They require much outdoor exercise, but they are calm indoors and show more watchdog abilities than other retrievers. With their weatherproof coat and tolerance of the cold, they could live outdoors, but it is not recommended. They need human companionship and the life of an outside dog without enough human interaction is considered harsh and cruel punishment. Dogs are social creatures and should never be left in solitary confinement. With that said, if the temperature is cold outside, and the house sweltering, some Chessies prefer the cool outdoor air. They do not do well as apartment dogs or with inactive owners. 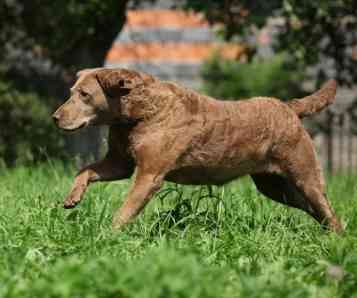 The best location for the Chesapeake Bay Retriever is in a home with a decent size yard. They are able to stand the cold better than the heat so most do best in areas that have a cooler climate. They love children and generally do fine with other pets. Their size and powerful muscular body may be too much for very young children. They are exceptionally strong and powerful, with webbed feet making them excellent swimmers. The retriever inside gives them a gentle mouth or bite making them the ideal choice for retrieving ducks and other birds. Exercise is critical to this breed. They need plenty of vigorous activities that should include swimming (their favorite activity). Without doubt, water is their absolute favorite and if a lake or pond is nowhere near, they’ll find water in a river, lake, ditch, puddle or raindrop. Long walks are also recommended. When an English brig was shipwrecked in 1807 off the coast of Maryland, an American ship rescued the cargo and crew and received two Newfoundland-type dogs. The dogs, Sailor, a male and Canton a female were sent to live in different areas of Maryland were then bred with other local retriever type dogs and a couple local hounds and spaniels. Careful breeding created a new brand of retriever that was not only skilled but an enthusiastic swimmer and retriever. Towards the end of the nineteenth century, these dogs were recognizable as a distinct breed, not only willing to swim but craved the notion of jumping into to retrieve ducks and other waterfowl. When the AKC (American Kennel Club) was formed in 1884, these dogs were well considered a separate and distinct breed and went on to being recognized in 1887, making them one of the first registered made in America dogs. Today, the breed ranks at the number 40 in popularity with the AKC. 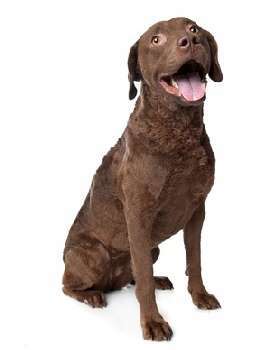 In 1964, the Chesapeake Bay Retriever declared the official dog of Maryland. Today, the breed is predominantly a companion, but they also excel in canine sports such as Schutzhund, field trials, agility, tracking, and competitive obedience. They are still used for hunting and some are being developed as therapy and guide dogs. According to the AKC Breed Standard. Life Span: About 10-12 years. Camouflage is the key here so different shades of brown are usually what you get: Brown, sledge or deadgrass. Brown color can range from a light silvery brown to deep dark brown. Sledge colors range from a reddish yellow to a chestnut color. Deadgrass, as the name implies can be anything from a faded tan to a straw color. A little white is also acceptable on their chest or stomach. Chessies are smart and eager to learn. However, they are also independent and can seem stubborn at times. Since these dogs are very commanding, it takes a skilled, confident owner to train them. Their strong-willed nature is probably too much for an inexperienced dog owner. They need the type of person who will be in control and committed. They can be legitimately dominant, so the owner needs to exert a natural authority over the dog. These dogs can get out of hand if they sense that the owner is passive, weak or nervous. They require early and frequent socialization and basic training that includes commands as well as learning how to be polite. 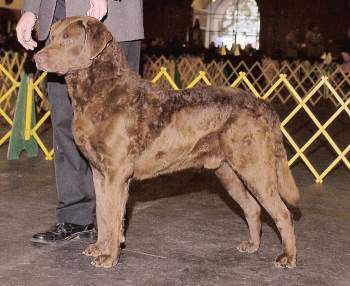 Compared to other Retriever breeds, the Chesapeake Bay Retriever can be used for protection. They are considered more vocal than similar breeds which make them an ideal watch dog. Their assertive, dominant personality makes them more likely to respond aggressively rather than break down if someone enters their space. If protection is your foremost goal for owning a dog, another breed might be more suited to your needs. The Chesapeake Bay Retriever has been called the Rottweiler of the Retriever family, but they are by no means a ferocious attack dog. Their coats are thick and short, usually no longer than about 1 ½ inch long. They have a dense woolly undercoat and a harsh, oily waterproof outer coat. The texture is vital because they tend to be outdoors under adverse weather conditions, including snow and ice. The oil in the coat helps them stay waterproof and keeps the cold water from touching their skin. It also helps get them dry with just a shake or two after swimming. For this reason, it is important to maintain this type of coat. Brushing one or twice a week is important. However, frequent bathing is not recommended. Several times a year may be all that is required. They are not big shedders but do shed or blow their coat twice a year. They will need to have their nails clipped regularly and their teeth brushed. Ears should be checked periodically and cleaned if needed. 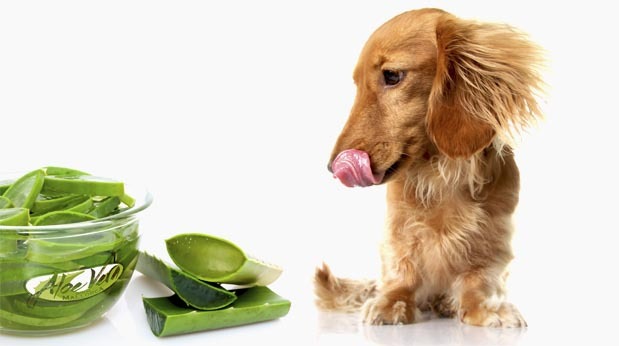 Grooming these dogs is easy, but what time you save in the grooming department, should be used for exercising and training. They are generally considered to be a healthy breed, but just like all dogs (and humans) are prone to some genetic disorders. The following list includes those that have been associated with the breed, but the chances of one dog having one or more of these conditions are small. This illness occurs because the thigh does not fit snugly into the hip joint. This may cause pain and lameness but not necessarily. Arthritis usually sets in as the dog ages. This may be a genetic problem or may be triggered by environmental issues such as trauma. Rapid growth with a high caloric diet has also been associated with the onset of the disease. This is a generative eye disorder that causes blindness. Luckily dogs do fine even after they have lost their sight because they depend on other senses especially hearing and smell to navigate their surroundings. Eyes can be checked in breeding dogs and any dog that may have problems should not be bred. This blood disorder shows up at about 3 to 5 years old and is caused by the von Willebrand factor in the blood preventing it from clotting properly. Dogs with this condition may bleed easily, have bleeding noses or prolonged bleeding after surgery. Sometimes blood is found in the stool. This is a common, yet life-threatening condition that affects large, deep-chested dogs. Bloat occurs when the stomach is distended air and then twists on itself. The dog is unable to burp or throw up to rid himself of the air and blood flow to the heart is hindered. Blood pressure drops and the dog goes into shock. Without immediate medical attention, the dog can die. It is usually brought on by a dog rapidly eating one large meal a day or drink water too quickly. Exercising after eating can also cause this to happen. We STRONGLY recommend a "non-gulping" bowl, to prevent this horrible condition. It is available from Amazon. Just click on the link above or the image below! Signs of bloat include drooling, trying to vomit without success, restlessness, lethargy and a weak, rapid pulse. Immediate veterinary attention is needed. Official Mascot of the University of Maryland, Baltimore County. Dog Breeds Expert always recommends reading as much as possible about the breed you are considering before the day you pick up that new puppy or adopt that adult Chessie. Here are a couple of good references for you. They can be purchased at Amazon, directly from this site. Just click on the images below for more information. These are comprehensive books for the experienced as well as the novice Chessie owner. Topics cover everything from care to breeding and more.